Social media has an interesting way of connecting people around the world.Looking through my news feed on Facebook one person’s updates caught my attention and I started to surf to her blog to learn a bit more about her and her background.When I realized that this woman had been traveling solo for 20 years in different parts of the world,I wanted to find out more about her and we connected for a talk on Skype. Well,my curiosity was rewarded and I came across a human being with a remarkable and unusual life story.Meet Lash,an American woman,who set off in 1991 to move to Japan where she lived for six years to save money for her trip around the world that so far has taken her through many parts of southeast Asia,Europe and Australia. I grew up in a typical American family in several small towns.My family took many trips around the eastern USA visiting national parks,forests,mountains,seashores,rivers and so on.We did lots of camping,hiking and enjoying nature. By the time I was in high school I couldn’t wait to get out of small town life and into the exciting world out there! I left high school early to attend University in Pittsburgh,Pa and never looked back! 2.What originally stimulated your interest in travel? 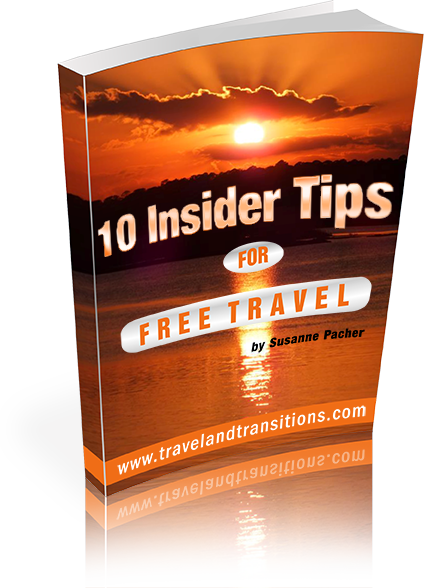 I credit 3 major factors to creating my current life as a long-term independent world traveler. 1.The travel with my family as a child definitely stimulated my interest in travel and my love of nature.I loved being out on the road,hiking in forests,clamboring up streams,frolicking in the ocean and climbing mountains. 2.In my early 20s my boyfriend and I went on a cozy New Year’s weekend retreat to a countryside B&B.At the time we knew someone who had recently completed a 6-month round-the-world-trip,so I suppose that was vaguely on our minds.In any event,my boyfriend exclaimed out of the blue “hey,maybe we should go on a world trip” At that instant something CLICKED in my soul and I knew,beyond the shadow of a doubt,that’s what I was going to do the rest of my life! Crystal clear. 3.When I was finishing up University,a good friend was living in Tokyo.He kept telling me how ‘rich’ he was teaching English in Japan.Bingo! I decided I,too,would go to Japan in order to save money for my world adventures. 3.You spent a number of years in Japan.Please tell us about that experience. I lived in Kyoto,Japan for 6 years,which I absolutely loved! Kyoto is the original capital of Japan (from about 800-1200 AD) and still considered the cultural heart of the country.On the side I was teaching English to save money to travel the world,but I really spent my time,focus and energy immersing myself entirely in the traditional arts of Japan.I studied tea ceremony,flower arrangement,koto (harp),aikido,butoh dance,shiatsu massage,taiko drumming and wearing a kimono.I regularly put on my kimono,attended temple tea ceremonies,performed publicly,went to performances and art exhibits,attended festivals,ate at specialty Japanese restaurants…and so on. When I had time off I explored Japan by train,bicycle and foot.In 6 years I managed to visit about 40% of the country.I soaked in hot onsens in mountains under falling snow,trudged up 100s of stone steps to mountain-top temples,chugged through the countryside on squeaky clean trains,camped in the wilderness,cycled around several islands and peninsulas,and enjoyed my 1st tropical Christmas on Okinawas’ Iriomote island. It was 6 years of truly amazing living! I was sad to leave but thrilled to begin my world travels. 4.What places have you visited in South Asia? Where do you usually stay? What about your experience adjusting to the local cultures and way of life? And what makes South Asia special to you? Most of my recent 20 years of life I’ve spent in Asia! This includes 6 years in Japan,followed by 13 years traveling around southeast Asia (and a few other places).I’ve visited most Asian countries extensively,several by bicycle.As it would be impossible here to detail 13 years of travels,I encourage you to explore my travel site about the countries you’re interested in.I’ve listed all the stories,by country here.